ONE of the region’s oldest and most beloved institutions is celebrating 100 years at the heart of Heddon. In 1915, the UK’s first Women’s Institute was established in Wales. And not to be outdone, a mere two years later the ladies of Heddon-on-the-Wall banded together to form their own Women’s Institute. An indefatigable force, Heddon WI went on to weather two world wars and will celebrate its centenary on March 5. The group began life in the village’s old library building with an annual membership fee of just two shillings. Local landowner Sir James Knott’s wife, Lady Margaret Knott, was invited to become the first president of Heddon WI. And in 1922, Sir James donated land to the ladies of Heddon WI It is on that plot of land that the Women’s Institute hall still stands. President Elizabeth Thompson added: “I’ve enjoyed reading through the archived committee notes to put together a centenary display. “The similarity between what they did then and what we do now struck me. At the outbreak of World War Two, the Heddon WI hall was requisitioned by the war office. Not to be deterred, the ladies simply held meetings in each other’s houses until their return to the hall in 1945. In 1962, the head office of the National Federation of Women’s Institutes suggested that running their own hall was not advisable due to costs. So the hall remained and is now home to coffee mornings, drama groups, Brownie packs, yoga classes and, of course, the Women’s Insitute. 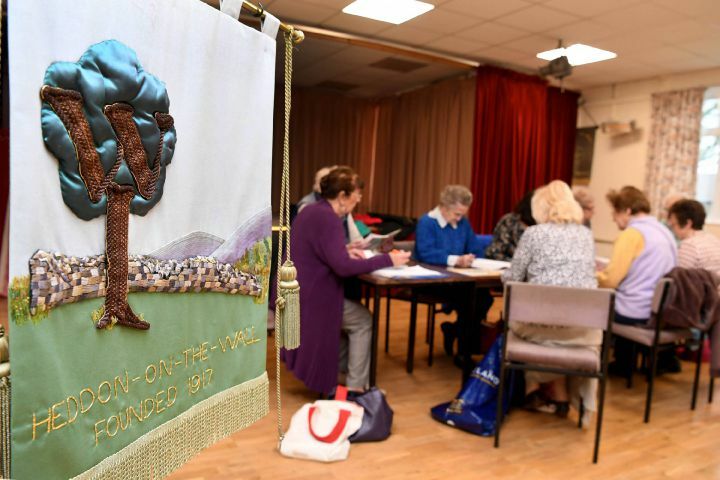 Every year, the WI ladies cater for Heddon’s annual village fair, and each summer they hold a coffee morning to raise money for a local charity. WI committee member Olive White said: “It’s the hub of the village; there’s all sorts of things going on all the time. Committee member Lesley Hawdon added: “I joined about 10 years ago. I came to a meeting with my sister-in-law and we were just made to feel so welcome. “We have very varied speakers; you find out about things you might not otherwise know about. Not long after I joined, we had a speaker from Tynedale Hospice. Heddon WI will celebrate 100 years in the village with a party on March 6. Each member will also receive a small gift to commemorate the landmark occasion.